My birthday is in less than a month and I decided it would be nice to make a birthday wishlist. 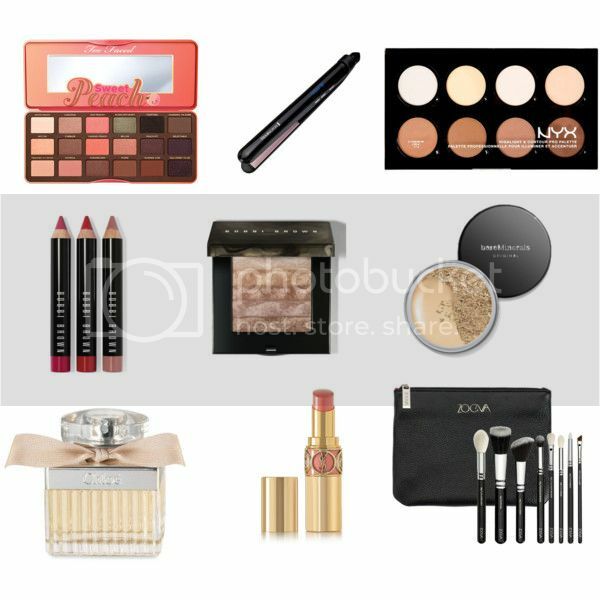 Since a Michael Kors bag is out of the question for my wallet, I decided to put together a wishlist with some beauty items I’d love to receive or get myself sometime. Too Faced Sweet Peach Eye Shadow Collection Palette: I had a Too Faced palette about 6 years ago the quality was nothing good. But I’ve heard and seen that it has changed a lot. And when I saw this palette I immediately fell in love and it hat to go to my wishlist! A hair straightener: I bought my hair straightener back in 2009 and it has been working fine until a few months ago, when it started smelling burnt. I cleaned it and there was no hair stuck, after speaking to a hairdresser, she said it’s probably time to get a new one. After all, it’s already 7 years old. NYX Highlight and Contour palette: I’ve been hearing a lot about this palette and I’ve been wanting to try it our for quite some time. At a pricetag of 20€, it isn’t very expensive, but I still haven’t had the heart to buy it. Bobbi Brown Art stick and the Shimmerstrips: I’ve never had any Bobbi Brown products, but I had the oportunity to get my makeup done for an event a few years ago when in Vienna and I fell in love! These two are definitely my favourites at the moment, but at a price of 30€ for the lip pencil and 52€ for the Shimmerstrips, it’s definitely expensive for my own pocket right now. BareMinerals original foundation: This is something I’ve wanted to try for very long. I got it sent to me a while ago, but it’s a shade too dark for me. However, I did try it and loved it! Even on my dry skin, it felt and looked perfect! I just need to get it in the color “Fair”, the lightest color they have – it is the perfect shade for me! Chloé Eau de Parfum: I bought a rollover version of this when I was in Portugal the last time and I am in LOVE! The big version however costs 58€ (for 30ml!!!). It’s extremely expensive, but it definitely is the best perfume I have ever tried. YSL Rouge Volupte Shine: I have ever wanted to try out one of Yves Saint Laurent’s lipsticks. They’re so luxurious, beautiful packaging and is something every makeup lover should try once in their life. 34€ for a lipstick is higher than what I usually give for a lipstick, but it definitely isn’t as expensive as a Tom Ford. Zoeva Classic Brush Set: I recently bought my first Zoeva brush, after my foundation brush of over 5 years decided to give up on me. I was a bit weary about trying these, but I have to tell you I am in love with it! So naturally, I decided I wanted this set! At a price point of 70€ it isn’t expensive at all, for 8 very good quality brushes. I love making these wishlists, it’s like seeing what I want to get. I usually never buy any of the things, or I end up getting the things I’ve wanted the longest. Do you like making wishlists? Let me know what is in yours!